It seems like very week another cat goes viral on social media. The latest media darling is a sourpuss named Sauerkraut. I wanted to find out if this cat has what it takes to go be the next Grumpy cat and was pleasantly surprised after speaking with Amy Bender. 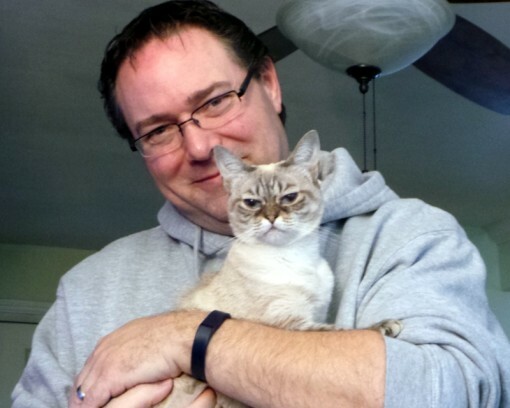 It turns out this is another special needs kitty and thankfully her owner has a heart of gold. I’ll sharing her special upcoming adventure in the months to come. Since 2010, Amy Bender and her family have fostered more than 100 cats and kittens at Central Oklahoma Humane Society. She is one of their only foster parents willing to take in under-socialized kittens and help them learn how to trust and thrive. Amy also provides wonderful enrichment for shelter cats and as a Sunday cat caretaker cleans cages and dispenses meds and much needed love. Amy Bender is a current finalist in the Purina Building Better Lives. contest for shelter volunteers. The winner’s shelter gets a $25,000 makeover. We’d love to see her win, so please click on the link and vote. She also kindly gave us exclusive images not seen elsewhere. Q. 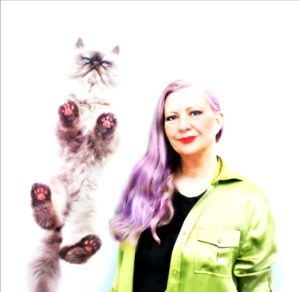 & A. with Amy Bender, Sauerkraut Kitty’s guardian. LMW: How do you feel that Sauerkraut is being compared to Grumpy Cat? What similarities are there if any? AB: I think Sauerkraut would be honored to be compared to such a well know celebrikitty. They are both small kitties, with a perpetual scowl. They are also both very small. LMW: As seasoned kitten foster and cat rescue volunteer; what are the best and worst aspects of your job? AB: The best would be saving lives. We have had kittens literally pulled from the euthanasia room. The worst would be when one of them dies. Kittens are so fragile and many of the ones we get are ill. It’s always heartbreaking. LMW: Sauerkraut arrived in your home as foster kitten, when did you realize she was different and when did you decide to adopt her? AB: We knew she was different immediately. She didn’t react to noises and she didn’t play like the other kittens. She was also very hard to feed. We decided to adopt her after fostering her for about a month. We knew she had special needs and we wanted to make sure she got the care she needed. LMW: Tell us about her medical conditions and what kind of vet and home care they require. AB: Sauerkraut has a grade 3 heart murmur which is checked frequently by her veterinarian. She also has some neurological issues that are undefined. We suspect they are congenital. 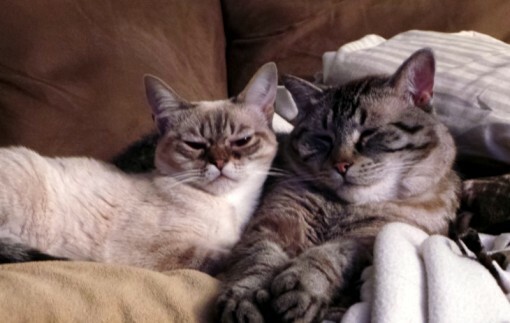 Most recently, she was found to have Feline Hyperesthesia Syndrome. She wears clothes to keep her from biting and clawing herself. They also work to calm some of her manic episodes. LMW: Many celebrity cats are special needs cats which has helped raise awareness. 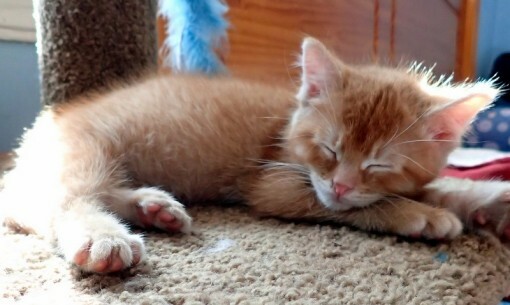 What would you like readers to know about adopting a special needs cat? AB: Special needs cats may need different types of care, but they are just as amazing to share your home with. Sometimes even more so, as you see such satisfaction in their victories! LMW: What are Sauerkraut’s favorite food, treats, toys and places to sleep? Does she respond to catnip? AB: Sauerkraut’s favorite food is Simply Nourish – Chicken Stew and Purina One – Smart Blend – Turkey. Her favorite treats are Friskies Party Mix. She would do just about anything for one of those. Her favorite toys are my feet and sometimes a stuffed mouse. She doesn’t usually play with toys like a typical cat. Her favorite sleeping spots are the youngest teen’s top bunk and on the back of the sofa. She hasn’t responded to catnip, though we do grow our own organic nip in the garden. LMW: What person or animal is she most bonded with? AB: Definitely her “Pops” for people and Brock for animals. LMW: If there anything about Sauerkraut have that would surprise readers? AB: She is an amazing hunter of bugs. She hunts them on the catio and brings them in. LMW: When did you come up with the name and what nicknames do friends and family call her? AB: We thought she looked rather sour, but we didn’t think the name “Sour” would help her adoptability, so we chose Sauerkraut. We call her Kraut or Kraut Kraut. LMW: What is your ultimate goal or dream for Sauerkraut Kitty? AB: I would love for Sauerkraut to be an ambassador for pet adoption and hopefully inspire folks to foster and volunteer! You’re going want to follow Sauerkraut’s rising star at Sauerkraut Kitty Amazing pics on Instagram and Facebook. I think she’s darling, and her name is cute too. Many Purrs for a healthy life. Count me in as a newly paid up member of the Sauerkraut is sweet gang!! What a sweet little girl………she’s lucky to have a family that understands her and will take care of her special needs………so many aren’t that lucky. She sure is a cutie!!! 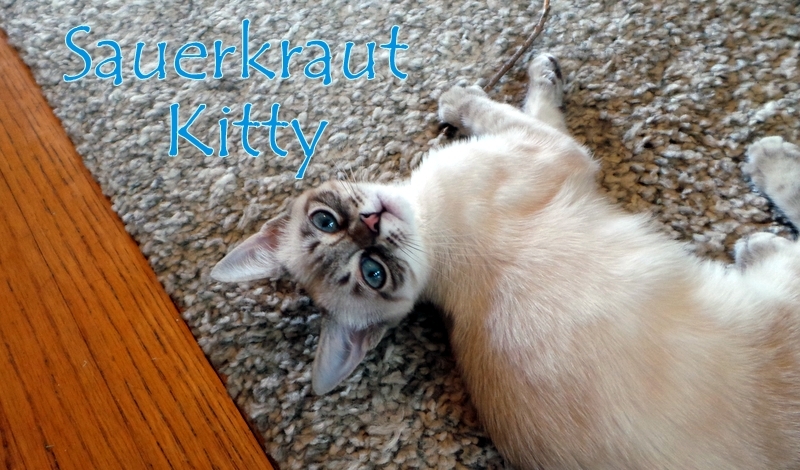 Love those eyes……..
Sauerkraut is absolutely adorable! Thank you for giving her a forever home and for fostering all of those cats and kittens! You are doing a great service for the cat community. Suerkraut be very purretty. So glad she got a furever home. It’s gweat dat there awe a foo shelters in Oklahoma dat awe duin’ good fur da animals. Voted for them. Aww Sauerkraut is adorable. 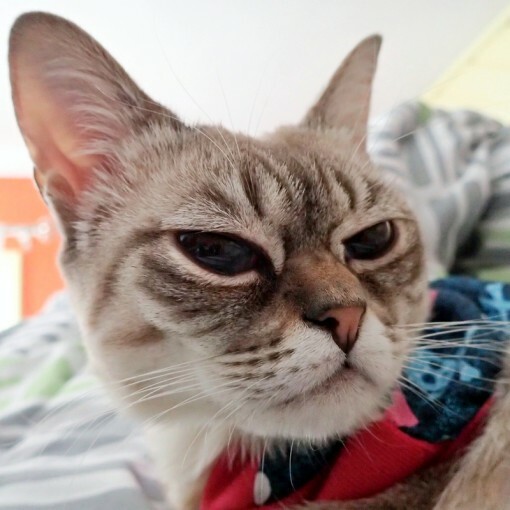 We love Sauerkraut and the work that most owners of special needs kitties are doing to raise awareness and help other cats in need. Sauerkraut is a gorgeous kitty! I’m glad that she found loving humans to take her in. It sounds like she has a lot of potential to help other cats all across the country (and maybe around the world). Sauerkraut is a real cutie! Sauerkraut looks a sweetie even if she does look like she is scowling. She obviously loves her dad. Thank you Amy for the fabulous work that you do! Thank you for sharing Sauerkraut with us and we hope that her mission is fulfilled!!!! We look foward to seeing more of her. Sauerkraut is adorable and we are so glad that they adopted her and help raise awareness for special needs. Sauerkraut and Grumpy and others with genetic defects are so important because they teach others that it is important to love the skin you’re in. For the cats themselves, they’re not self-conscious in that way, but it is important for people to know how important it is to love others in the skin they’re in. Glad that these special-needs kitties get the help they need. Cats help us in so many ways, and with these special needs kitties, they help us in even more ways – teaching us and showing us acceptance. Actually we thinshe is darn cute! I like to think I’m an early adopter of the Sauerkraut craze–I’ve been watching her for some time. It pleases me that she lives fairly close (well, 300 miles or so=neighborhood). It also pleases me to know of her family’s fostering activities. Go, KrautKraut, go! Honestly, I think Sauerkraut is beautiful!